The documents listed below are available free. They are generally the most up-to-date source on the latest demographic and economic trends in Central Arkansas. The annual Demographic Review and Outlook is generally published in May or June, while the annual Economic Review and Outlook is published in November or December. Metrotrends 2016 Economic Review & Outlook. Articles include: Cyber-security in Central Arkansas, Economic Outlook 2016. Metrotrends 2016 Demographic Review & Outlook. Articles include: Housing Trends in Central Arkansas, Population Change and Migration, Benton's Downtown Initiative, Demographic Outlook 2016. Metrotrends 2015 Economic Review & Outlook. Articles include: the Future of Work in Central Arkansas; job growth and unemployment data, UAMS BioVentures, the Creative Corridor and the Economic Outlook for 2016. Metrotrends 2015 Demographic Review & Outlook. Articles include: Population Trends; Contending with the Megapolitans; Poverty and the Suburbs; Roads, Revenues and Suburbs of the Future, Demographic Outlook 2015. Metrotrends 2014 Economic Review & Outlook. Articles include: The New Economy, Big Data, Axciom, Restaurant Entrepreneurs, Local Housing Market, and Construction Value Trends. Metrotrends 2014 Demographic Review & Outlook. Articles include: Walking for commuting & recreation, MSA population change 2010-2014, Jacksonville in transition, mulitfamily housing, Housing construction 2010-2013 comparison. 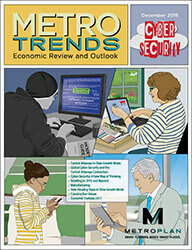 Metrotrends 2013 Economic Review & Outlook. Articles include: Central Arkansas economic recovery in 2013, The Argenta Innovation Center, L'Oreal and a greener future, UAMS BioVentures, Housing Market, and Economic Outlook for 2014. Metrotrends 2013 Demographic Review & Outlook. Articles include: Workforce in Transition, Population Change, Housing Construction, and Metropolitan Arkansas 2013. Metrotrends 2012 Economic Review & Outlook. Articles include: Economic recovering & employment, Manufacturing 2012, Suburban Rebuild, Sustainable Success in SoMa, Local Housing Market, and Construction Value Trends. Metrotrends 2012 Demographic Review and Outlook. Articles include: Central Arkansas in 2040, Commuting and Housing Rankings, The Coming Decade, Demographic Outlook for 2012. Metrotrends 2011 Economic Review and Outlook. Articles include: Tracking Recovery in 2011, Building a Green Economy, Construction Value Trends, Economic Outlook for 2012. Metrotrends 2011 Demographic Review and Outlook Census 2010, migration trends, shifting ethnic identity, the new normal in housing, core area comebacks, and demographic outlook 2011.